Portsmouth City Councilor Josh Denton and James Penfold|! !| co-founder of EV LaunchPad|! !| show off the electric car charging station near City Hall. 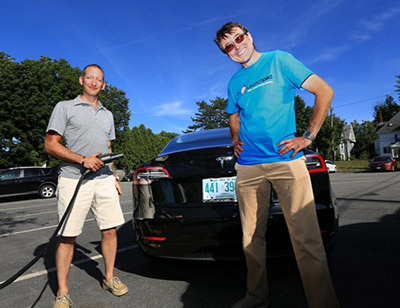 Six celebrations will take place in New Hampshire next week in honor of the eighth annual National Drive Electric Week. The celebrations are in coordination with 252 events nationwide to draw attention to the economic and environmental benefits of electric vehicles. Event organizers include Drive Electric NH, a coalition of public and private stakeholders; the Electric Auto Association; Granite State Clean Cities Coalition, a collaborative of over 140 public and private interests from all regions in New Hampshire; the New Hampshire Automobile Dealers Association; New Hampshire Sierra Club and Plug-In America. The series of events will kick off with a celebration in Concord on Saturday, Sept. 8 at City Plaza, in front of the State House and next to the Concord Farmer’s Market. Electric cars such as the BMW i3, Chevy Volt, Chevy Bolt, Honda Clarity, Nissan Leaf, Tesla Roadster and more will be on display, as well as other related electric technology, from 8:30 a.m. until 1 p.m. There will also be informational materials on hand regarding electric cars and their environmental benefits, vehicle charging information and other electric technology. Attendees may get the chance to drive a vehicle. Portsmouth's event, which takes place at the City Hall Parking Lot (1 Junkins Ave.) on Sunday, Sept. 9 from noon to 4 p.m., will also provide attendees with the opportunity to drive a Tesla or the City of Portsmouth's Chevy Bolt. There will also be a ribbon cutting ceremony at the charging station that was recently installed at the City Hall lower parking lot. The Portsmouth City Council is on the cusp of passing an ordinance that would provide the legal framework to continue the expansion of electric vehicle stations. In addition to City Hall, there are charging stations in the Hanover Garage and construction is underway at the Foundry Place Garage for charging stations that are expected to be available sometime later this fall. Denton also thinks the city should invest in fast chargers to be placed in Market Square, where some visitors spend only 30 minutes to an hour. Portsmouth City Council Members sent a letter to Gov. Sununu last December requesting the full 15 percent of funds available for EV charging infrastructure to be allocated, however the state has yet to release it's final plan. 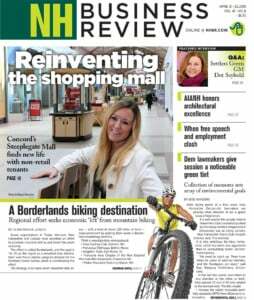 “If we do not grow a more evenly-distributed network of fast-charging hubs, Portsmouth and other New Hampshire communities will miss out on tourists that will choose other better-supported routes and destinations,” read the letter, which notes Quebec's aggressive promotion of zero-emission vehicles and supporting a build-out of province-wide fast-charging network. Other National Drive Electric Week events in New Hampshire will be held in New London on Sunday, Sept. 9 at the New London Historical Society (179 Little Sunapee Road); in Plymouth on Thursday, Sept.13 at the Common Man Inn (231 Main Street); in Keene on Saturday, Sept. 15 at Keene Ice Arena (380 Marlboro Street) and in Exeter on Sunday, Sept.16 at the Exeter Town Hall Parking Lot (and bandstand). Visit https://driveelectricweek.org/ for details.